The average age of America’s farmers is rising as fewer young people stay in rural areas to tend the land. Cody Hopkins, a founder of the Grass Roots Farmers’ Cooperative, is an exception. 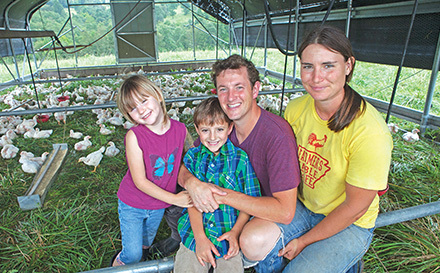 He and his family are part of a new generation of farmers who focus on providing healthy food in ways that are also healthy for the land. With 10 years of farming experience under his belt, Hopkins and other cooperative members are working with Heifer International to make a living income for small-scale farmers a possibility. Hopkins talks about his journey into agriculture, the work of the Grass Roots Farmers’ Cooperative and the future of the family farm. 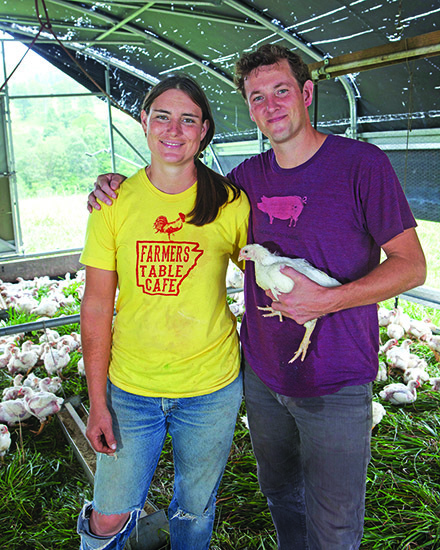 Andrea Todt and Cody Hopkins run Falling Sky Farm. WORLD ARK: What was your journey into agriculture? CODY HOPKINS: Sure, so I grew up in rural Arkansas. I was the first person in my family to go to college. I got a degree in physics and moved away after college to the Northeast and taught at a private school up there for a couple of years. I wanted to get away from rural Arkansas, but as soon as I was away I just found myself craving it and moved back. When I moved back to Arkansas I managed a small bakery in North Central Arkansas in Leslie called Serenity Farm Bread. While I was there I got to play a big role managing the business and started to catch the entrepreneurial bug. At the same time Searcy County, where I was living, was named one of the poorest communities in Arkansas, which makes it very high on the list nationally, and it was just pretty obvious that very little, economically, was going on there. So this confluence of interest in food and entrepreneurship and rural economic development was driving me to look at master’s degree programs. It was then that I stumbled upon Joel Salatin, the father of pastured poultry. I think I read about him first in The Omnivore’s Dilemma by Michael Pollan. His model of small-scale, sustainable farming seemed like a powerful tool for economic development, and it was a perfect fit for what I was hoping to do. I then met my now wife, Andrea. She grew up homesteading in Arkansas and knew a lot more about farming than I did. Together we launched Falling Sky Farm in 2006 with the goal of creating an economically viable demonstration farm. We wanted it to be a business that would not only make a living for ourselves, but also create some jobs in the community. We’ve been at it for 10 years now. What has been most surprising to you in those 10 years? I was really green when I went into it so I didn’t have a lot of assumptions, but it has been very difficult to piece together a profitable farm venture, more so than I thought. We’ve never really had a big issue selling our product at decent prices and production. That’s actually probably the easiest part of what we do now. What was really hard was trying to manage a vertically integrated operation with so many different enterprises. From the production side you have processing, distribution, aggregation, market development, accounting—all those things necessary for a financially viable business were really challenging. That was what led us to push for a cooperative model to share parts of that value chain in a way that would be more efficient and to bring in professional help to do it better. We wanted it to be a business that would not only make a living for ourselves, but also create some jobs in the community. Tell us how the cooperative works. We weren’t the only ones having these problems. There were other farmers we had good relationships with that were having the same issues, so we all started talking about how we could help each other. It started organically through sharing the costs of a bulk load of organic feed or taking animals to the processor together or sharing a restaurant customer we couldn’t supply by ourselves. These informal relationships led us eventually to reach out to Heifer, which helped us initiate the Grass Roots Farmers’ Cooperative. If you’re a member of Grass Roots, we provide you with technical assistance on the production side to help you make sure you have the right infrastructure, that you’re using the right feed, that you’re using the right production techniques, that if you have a problem with your animals there is someone you can call. This helps the farmers focus on farming. They raise the animals and from that point Grass Roots takes over. What factors make it so difficult for family farmers to earn a living income? Today our biggest challenge is diff erentiation in the marketplace, because all of these larger companies are using the same language that we’ve used to diff erentiate our products. Labels like “free-range,” “pasture-raised,” “organic”—those things are meaning less and less. We’ve landed on really focusing on trying to provide things like “farm of origin” and transparency from pasture to plate. Right now, we’re launching a feature where every package of meat from Grass Roots will have a QR code that customers can scan, and it will take you back to the origin story of that chicken. You’ll be able to see which farm it came from and drill down to learn more about the farm. You’ll be able to see where the chicken was processed, and you can drill down to learn more about the processing company. We are working to provide radical transparency for customers so they can really trust that they’re getting what they think they’re getting. The entire family pitches in with the chickens. You have a family now. What is it like balancing raising animals with raising children? Before the cooperative it was a really tough lifestyle for our family. We were constantly on the go making deliveries or taking animals to the processor. I’ve really seen a significant difference on our farm. My work is now mostly off the farm and focused on the Grass Roots Farmers’ Cooperative, and my wife, Andrea, is the primary farmer. We are now producing about twice as much with Andrea and two parttime employees than we did when both of us were farming and we had several employees. With the co-op, we’re able to let the farmers focus on the farming side of things. It’s really simplified life on the farm. If someone’s reading this and has thoughts of farming themselves, what would your advice be? The very first thing you do is visit a farm that is like what you’d hope to build yourself and try to spend the day at least. It would be good to read books and to go to small farm conferences. I know that Heifer USA is starting to roll out a series of training courses around the production models that Grass Roots and New South [another Heifer-partnered cooperative in Arkansas] do, so take those courses or something similar. Then take some time to write down your family’s financial and lifestyle goals because this is a lifestyle job. This is not a job in which you check in at 8 and check out at 5. It’s important that people understand that and make sure this fits in with their goals, both financially and in the way you want to spend your time.